Spring is here once again and as everything around me is blooming, I can't help but dedicate this month's nail inspiration post to flower nail art that is perfect for spring! 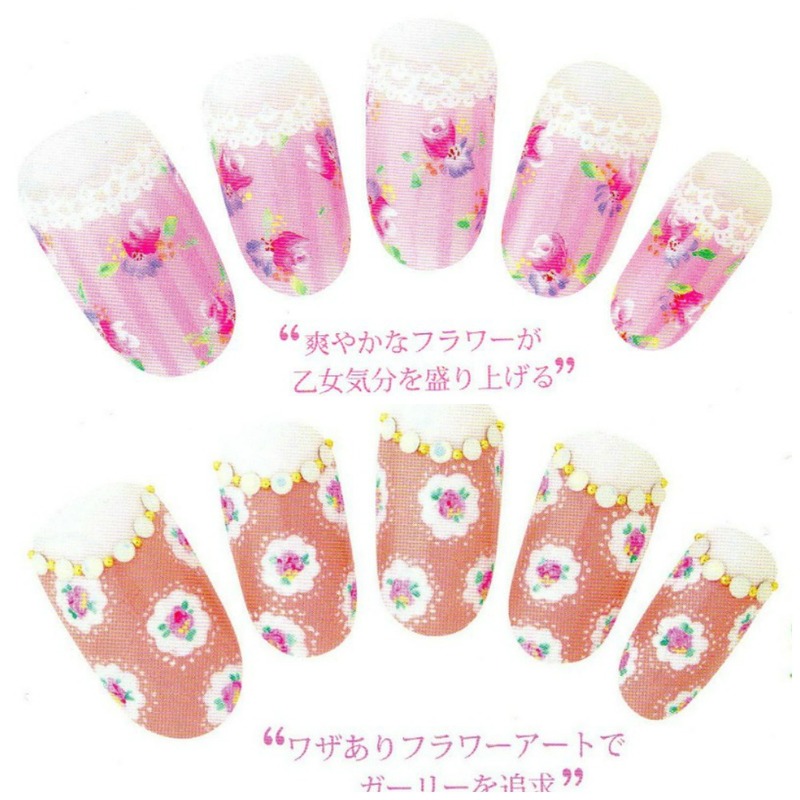 All this month's nail art comes from Ericonail, one of the most well known nail salons in Japan, that also has an exclusive nail art supply line. 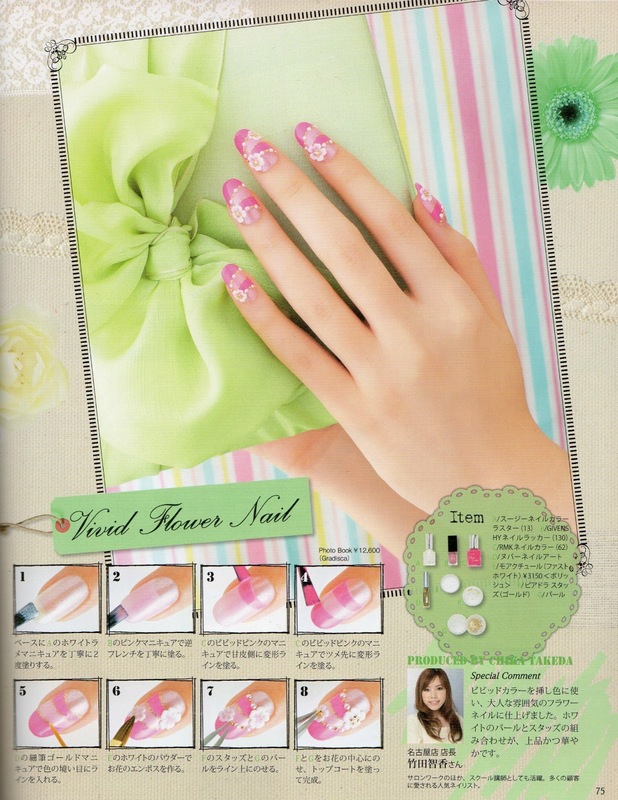 Check out these fabulous floral nail designs! If you would like to have something similar on your own nails take a look at these step by step nail art tutorials. 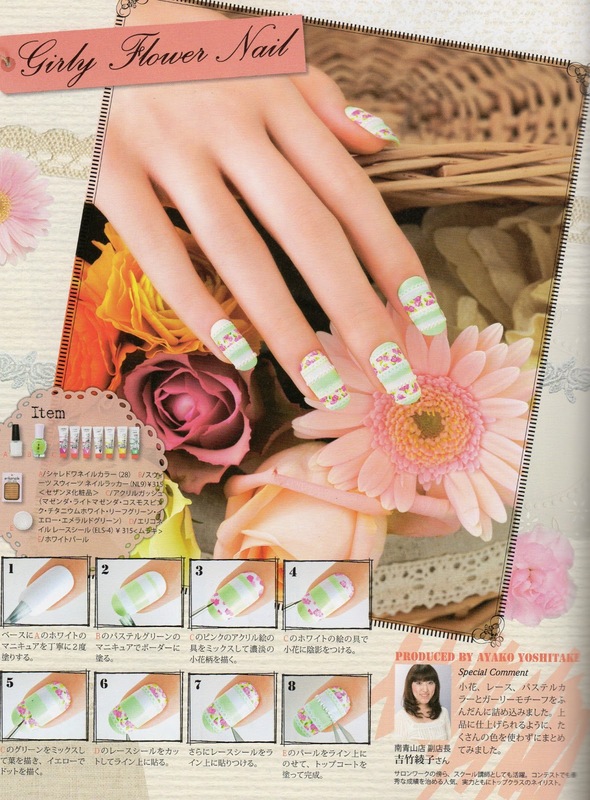 The first tutorial is a girly flower nail art design by Yoshitake Ayako. A design in pastel colours with small flowers and lace. You will need two nail polishes in white and pastel green (or any other pastel colour you like really), lace nail stickers, acrylic paints in shades of pink and green (for the flowers) and silver bullions (I find these optional). Then you carefully follow the instructions in the pictures. Of course you can modify the design as you see fit. 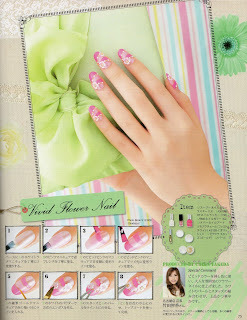 The second tutorial is a vivid flower nail art design by Takeda Chika. A design in shades of pink with beautiful 3d flowers and a hint of glitter. 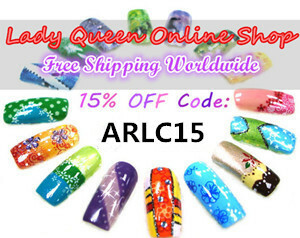 You will need three nail polishes in pearl white, pink and fuchsia, acrylic powder (or 3d flower stickers which are easier to use), a glitter nail art polish, pearls and gold bullions. What do you think of these nail art tutorials dear readers? Would you every try something like this on your nails? Also don't forget to enter my kawaii giveaway, open until Marxh 31st. I would so love to see, if you did any of these! Your nail art skills are amazing! I love the pastel and springy colours! Super cute designs!